While the Megami Tensei (or MegaTen) series of role-playing games have never featured the jaw-dropping visuals of the Final Fantasy series, or enjoyed the massive popularity of Dragon Quest, you just can't beat the series for style. 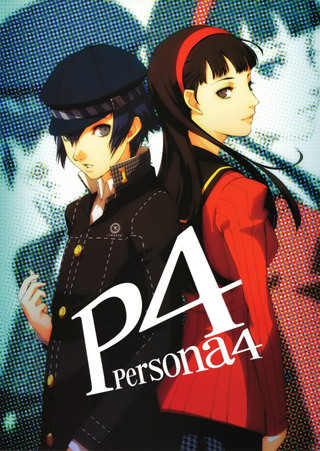 The Shin Megami Tensei: Persona spin-off series, of which there are four main entries, does a particularly good job of wrapping up a modern day setting and the mythological lore the greater franchise is known for with incredible flair. 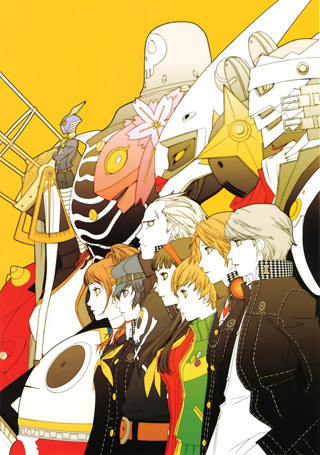 Between the art style, the music, and clever interface design, playing Persona feels like nothing else. However, while it's obvious existing fans will eat this show up with a spoon, you may be wondering if you should bother with it if you've no interest in the games. 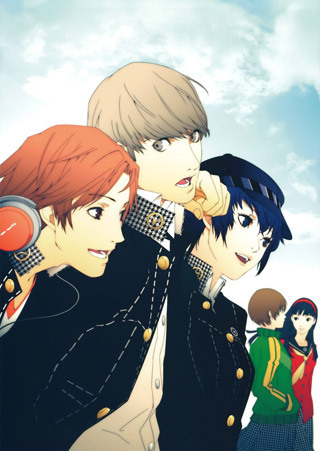 While the Persona fans among us make it difficult to be impartial, our answer is yes: aside from its RPG pedigree, P4 has great characters and humor, and you don't need to be the least bit interested in the 80-hour grind-fests the video games present to appreciate that. The story is at heart a small town murder mystery. 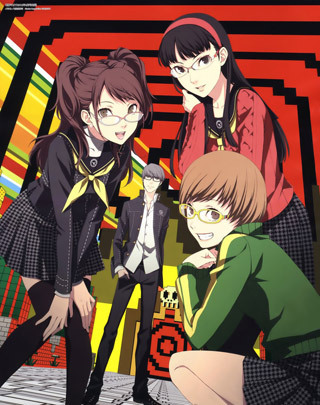 High school student Yu Narukami has barely moved into the fictional countryside town of Inaba before dead bodies start showing up near his school. Soon, he and his new friends discover a connection between the murders and the Midnight Channel, a mysterious phenomenon where turned-off televisions broadcast images on rainy nights. Realizing that the murder victims turned up on the Midnight Channel before their deaths, the students find themselves in a bizarre world inside a television set when they try to investigate. 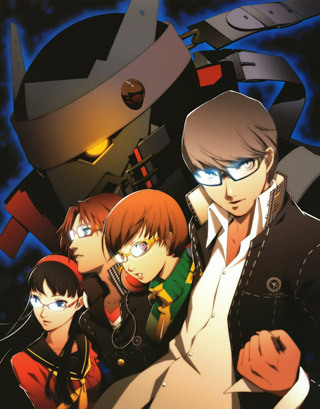 Soon, Yu and his friends awaken to the power of Persona, or alternate forms with superpowers that they can summon, which they use to try to rescue the victims they see on the Midnight Channel before it's too late. 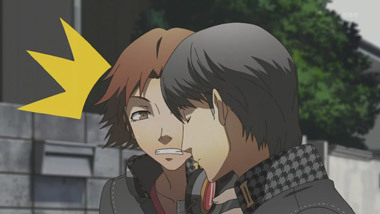 P4 takes a few episodes to really get going. 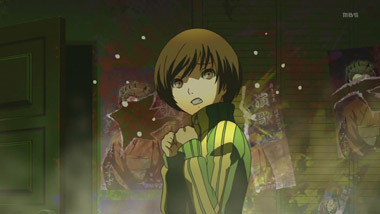 The beginning suffers from some tonal dissonance, as the wacky high school hijinks that ensue when Yu meets friends Chie and Yosuke really doesn't mesh with the series of gruesome murders they're investigating. 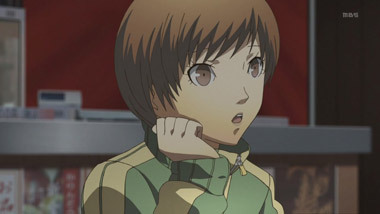 However, once several characters can summon their Personas and trips to the strange world within the TV set become routine, the series quickly becomes addictive. In addition to watching the murder mystery unravel, each new character (and their subsequent Persona) presents their own mysteries that make for compelling viewing. 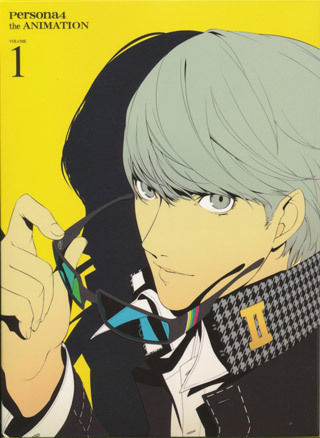 Yu himself is a great central character, although it isn't immediately obvious. At first we thought he was a textbook example of the "mild-mannered nice guy" school of protagonists, only to realize he's also quite the instigator. 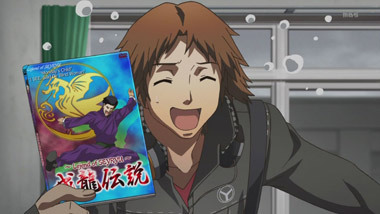 Usually, when characters incite others to mischief, there's some kind of subtle wink at the audience, but not so with Yu; he encourages his buddies to do ridiculous things completely deadpan. This leads to many great "Did he really just say that?" 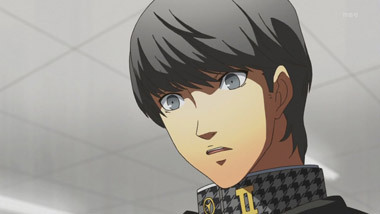 moments, where Yu's straight face leads you to wonder if he even realizes what he's setting his friends up for. The polar opposite of the irritating, emotionally overwrought protagonist, we always wanted to know more about what's really going on in Yu's head than we ever do. 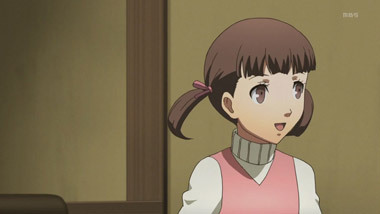 Other characters we quickly warmed up to include Ryotaro Dojima, Yu's police detective uncle who can sense his nephew knows more about the case than he's telling, and Nanako, the detective's level-headed young daughter who's sweet but never annoying. Another standout is Teddy, a truly bizarre (yet adorable) mascot character who thinks he's a bear, despite the fact that he looks absolutely nothing like a bear. We're still trying to figure out what's up with that. While the series excels with character interaction, the action scenes are more of a mixed bag. Between the detailed Persona designs for each of the main characters and the monstrous Shadows they must fight, producing fluid animation for the battles would be a tall order. We rarely see multiple Personas fighting at the same time, even though in theory they should be, and the action tends to happen in quick little bursts, punctuated by expository dialogue. 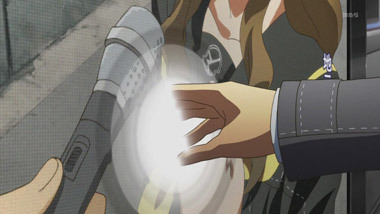 Still, it's usually pretty clear what's going on, and the series has its moments-- especially when Yu, who can summon multiple Personas, really cuts loose-- but the action scenes are more of a means to an end than a main draw here. Much like with the games, the art style and clever direction divert your attention from some less-than-stellar visuals. Another mixed bag is the filler episodes. Despite ostensibly trying to keep their neighbors from getting murdered, Yu and friends have plenty of time to go on school trips, hold a cultural festival, and indulge in other high school anime staples. 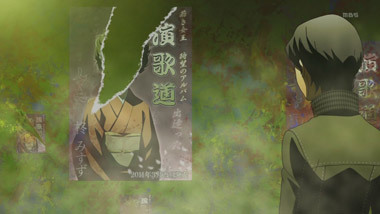 To their credit, the filler episodes are often very funny, but viewers that are mainly intrigued by the murder mystery plot may find them tedious. Other aspects of the show fall into a kind of grey area: while some will find the encounters with characters' Shadows, or alternate personalities, interesting, others may find them banal. One encounter, dealing with a stereotypically homosexual character, may offend some viewers; we thought the episode was more about the fear of the perception of being gay than actually being gay, hence the stereotypes didn't offend, but needless to say, it's open to interpretation. Furthermore, while the music is fitting, be aware that this show loves slightly awkward English lyrics like RPG players love leveling up. 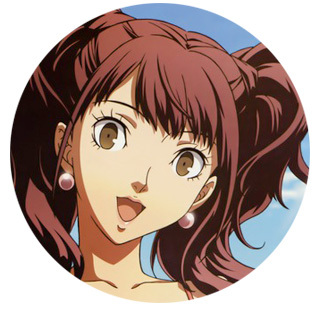 Still, questionable bits and all, P4 does its source material proud, with solid writing and a sophisticated presentation that is second to none. 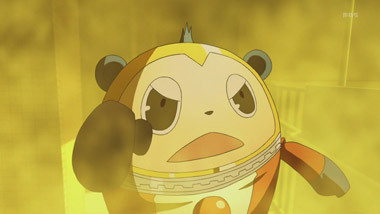 Now that the series has been licensed by Sentai Filmworks for a subtitled 2012 release, anime fans all over will soon be able to join us in our speculation about what, exactly, is going on with that Teddy guy. 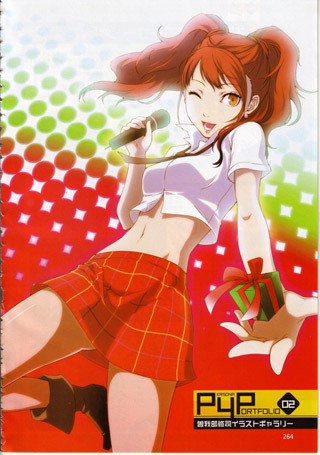 Below: Promotional illustrations for Persona4.